July 11, 2009 Arpan is a performing arts organization in Seattle. 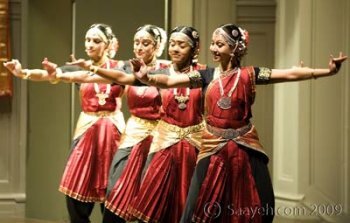 Founded by Dr. Joyce Paul Poursabahian, it is dedicated to the promotion of folk and classical traditions of India in Washington State. Joyce is an accomplished Bharatanatyam dancer trained by Leela Samson, Prof. A Janardhanan, Guru MR Krishnamurthy of Kalakshetra and also Prof. CV Chandrashekar and his daughters Chitra and Manjari. 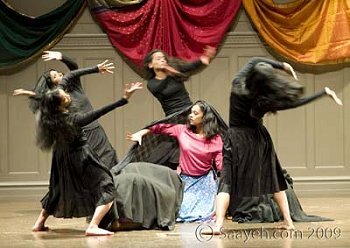 The Arpanites gave a memorable performance titled Ehsaas 2009 at Town Hall, Seattle on June 12, 2009. The show featured the premiere of Arpan’s new composition ‘Laya Samvaad’ (Rhythmic Conversations) composed and choreographed by Joyce. Also, traditional Bharatanatyam compositions and creative pieces choreographed by the students were presented. The show lasted up to three hours and was a wonderful display of colors, energy, music and concentration. 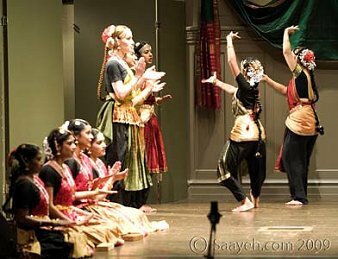 The first part contained items such as Pushpanjali, Shabdam, Keerthanam, Padam and ‘Kala Prayanam.’ In the second part, the dancers performed the premiere of their new production ‘Laya Samvaad’ and creative compositions inspired from themes like “Maadumeikum kanne” - a Tamil folk song, flavors of various dances including Salsa, Freestyle and Flamenco, Rasas and Hope. Some of the items in the second segment had a combination of Indian classical music and international music. I was told that the outfits were designed by Joyce and were individually sewn by the students just for the program. They looked uniform and beautiful. The show started with Pushpanjali in Gambheeranatai ragam and Tisra eka talam. The items “Sarasijakshulu” and “Natanam Adinaar” that followed, slowly gained steady momentum. The dancers displayed firm control over movements and talam. “Theyyale” in Kalyani ragam, Adi talam is a popular composition performed in any arangetram. The dancers presented this item beautifully in a story-telling format and let the audience discover the end of the story in their dance. ‘Kala Prayanam’ (Journey in Time and Space) and ‘Laya Samvaad’ (Rhythmic Conversations) performed with a brief intermission in between, set the theme, pace and identity of Ehsaas. These items choreographed by Joyce, displayed graceful movements underlying a unique concept. In ‘Kala Prayanam,’ the accompaniment of local musicians from the area was exceptional. The musicians involved were Gaurav Chanda (vocalist), Manoj Biswas (tabla) and Satyajit Limaye (flute). They performed exclusively soothing Hindustani pieces in Bhageshri raag as a prelude where the dancers wove patterns in space and time defining their destiny. Joyce expressed that she had always wanted a choreographic piece that would use space on the stage from multiple levels. 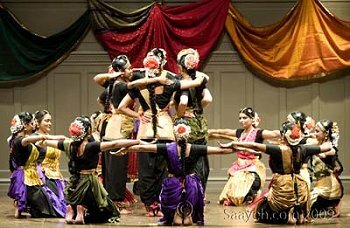 At a point in ‘Kala Prayanam,’ the dancers occupied positions in different directions on the stage. At the end of the piece, one of the dancers who represented Kala (time) touched every other dancer on the stage. Each of them reacted differently to her touch, expressing every possible human emotion influencing our lives and guiding us through our destiny. “Laya Samvaad or Rhythmic Conversations,” Joyce says, “was born out of the chronic lack of local Bharatanatyam musicians.” In order to overcome the challenge, the dancers in this item were made to recite percussive syllables (sollukettu) and sing out basic notes in varied beat counts (jathis) for other dancers. The dancers used cymbals, snapped their fingers and clapped their hands for rhythm (layam) and setting the meter (thalam). In the creative composition segment, the Arpanites performed items that were choreographed by the students themselves. The interesting part is that the students consisted of both children and adults. 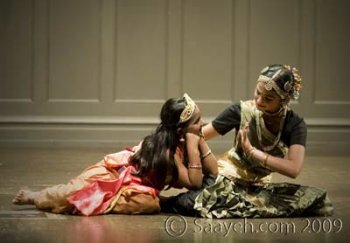 While students displayed skills in abhinaya, nritta and mental coordination, this was an opportunity created for them to explore other world cultures and see how they could merge cultures with their dance. Every one of these dancers has done their Guru proud. In a show of this nature, the dancers displayed thoroughly expressive ideas in conception, presentation and well-practiced recitals, embroidered by Joyce Paul Poursabahian. 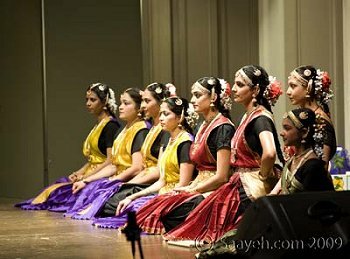 Joyce’s vision of realization through Indian dance to the local community of Seattle came across very cheerfully. The ushers dressed in glimmering saris greeted the guests with grace. The show was not just charmingly involving but also professionally executed with respect to time. The audience was enamored with Ehsaas and the creative display of Bharatanatyam in all its elegance by Arpan. Suma Subramaniam is a poet and writer living in Seattle, Washington.